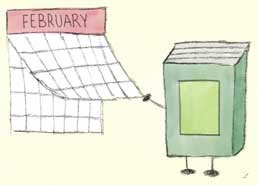 February is a short month to begin with, and man, did it fly by. I participated in my first ever 5K, doing a little bit of jogging but mostly walking. I'm happy to report that I 1) didn't finish last, 2) finished in under an hour, and 3) didn't require oxygen or defibrillation when I crossed the finish line. The event took place on Valentine's Day, so I felt that it was perfectly OK afterwards to eat more chocolate than I normally would have to, you know, replace lost calories, lol. Hahaha! Congrats! 3 years ago a friend signed me up for 5k runs and the event usually falls around my birthday. It was a great experience for me and sort of symbolic. I failed to join last year because of some injuriy but I plan of doing it this year. Running is serious business, I thought you just do it and you'll be fine. Gah! It is serious business! I jog around the block a few times a week, nothing intense, but I'm glad I'd been doing some kind of exercise beforehand because even walking for most of the route, my knees were achy the next day, lol.